Watching Mike tuck in to his second jelly today, it’s hard to ever remember a time he didn’t eat. Three years on from feeding therapy beginning, we are a long, long way from him ever not eating again. It was in 2014 when finally after 18 months of fighting, our Clinical Commissioning Group (CCG) agreed to fund specialist feeding therapy with Clarissa Martin from Midlands Psychology, for Mike. My then MP, John Leech took the reins and identified my son’s exceptionality for this treatment to our CCG, at a point there had been no option but to tube feed my two year old son, against my wishes. With the tube in, he was settled and growing and learning to tube feed him while continuing to promote oral eating was an enormous task. I decided to be relieved he was fed and concentrated on nursing my baby back to health, after-all how could I be right over a pediatrician? John Leech on the other hand, had other ideas, describing me as ‘the expert when it comes to Michael as she has all the information from the different teams who have been trying to assist him’, to the CCG. I dug out the correspondence John Leech sent, fighting my corner at the lowest point in my life. ‘This is exactly what Rebecca was trying to avoid when she applied for Michael to be allowed funding for the Loughborough team. She has been fighting for funding for months as there is no local expertise that can deal with Michael’s almost unique feeding problems. Rebecca has only received answers to her queries from the Loughborough team who have been able to provide her with additional information. She has repeatedly advised that the naso-gastric tube feeding will only exacerbate any problems Michael already faces and it is imperative that this is avoided. Over 18 months I’d sat in meeting after meeting, with more than 10 professionals involved. Not one of them wanted to make a decision as to the best course of treatment for my baby. 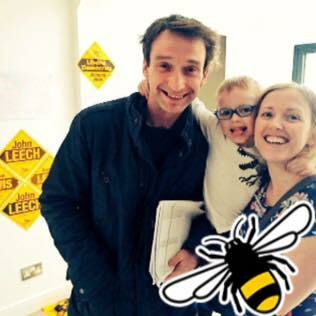 Nobody wanted to simply admit that treatment available outside the NHS was probably going to work for him – John Leech was the only person who stood up to support me. The thing was, Mike just wasn’t weaning and no amount of advice tailored to children with additional needs and feeding problems, or medical investigations gave us any answers but we were left with a huge problem, Mike was starving. By 9 months old, our senior feeding, Speech and Language Therapist had told me they couldn’t help but she put me on a path to investigate Clarissa Martin, of Midlands Psychology. She was a world leading consultant clinical psychologist specialist in children’s feeding disorders. I spoke to her and immediately knew she understood my son’s problem and could make him better. The NHS had treatment available to Mike by way of tube feeds (that’s how these problems are usually dealt with) but this was like treating a broken arm with antibiotics. Mike could physically eat so the reality was if we tube fed him, he’d certainly become tube dependent which was then adding to his disabilities, given there was no medical reason to tube feed him. From being 16 months to 23 months old, my baby didn’t grow. At 23 months his weight plummeted after a vomiting bug and he weighed at that point, 7kg or just over 15lb. To put that in to context, the size of a small 6 month old baby. There was no way he could come back from that, with such a low intake of food. Not only was he small, he was restless and didn’t nap or sleep at night. His development had completely stalled while he’d not been growing and he’d spend most of the days and nights trying to bang his head off anything he could. I was desperate to feed my little boy but he had no drive to want to eat, no understanding to swallow and an absolute fear of any sensory input. The treatment John Leech secured for us however changed all of this. Feeding therapy was tough. We trained Michael to accept a spoon, swallow and not vomit over the course of about two years. Three years on, things aren’t that draconian but his feeding still needs extremely close management. Out of his feeding therapy became a delightfully happy and loving little boy. Within months of treatment starting, he began to walk and by three he started to speak. He’s not stopped talking since! Mike has always grown from the day the CCG awarded the funding for him. We’ve never and will never have to resort to tube feeding Mike for these reasons, ever again. Three years on John Leech was right when he called me the expert in my son. He believed in me when I’d lost all belief in myself and professionals were telling me to stop trying. Out of all those professionals involved, John Leech was the only one brave enough to admit this treatment was right for my son. I’m grateful every single day that John Leech fought and secured my son and I, this opportunity. On 8th June 2017, there is only one MP for ManchesterWithington. Whether it’s a problem with your wheelie bins or life changing issues like mine, John Leech cares and puts his heart on fixing your problem. He believed in me and used the authority he had, to do the right thing and secure this treatment for Mike. Nobody else involved in our case, was prepared to do that.